Triceps tendonitis is an infrequent but often very limiting cause of elbow pain in athletes. Baseball pitchers and other throwing athletes are usually the ones who experience this problem, but occasionally it can be seen in weightlifters. It is an inflammation of the triceps tendon as it inserts into the olecranon process (the tip of the elbow). Athletes with triceps tendinitis typically complain of pain that comes on over time rather than after a specific injury. Usually pitchers notice it after a stretch of throwing progressively for a period of time with little rest. They will complain of pain just above the tip of the elbow mainly with activity and for a short period of time just after activity. Rarely this pain exists at rest or with activities of daily living, although it can start to affect daily activities as the problem progresses. In the office, the sports medicine physician can typically make this diagnosis by physical exam. He or she will notice tenderness to palpation in the triceps tendon just above the olecranon process. He will often have pain with resisted elbow extension. Usually range of motion, strength, and joint stability are normal. X-rays are usually unremarkable. Occasionally, with prolonged symptoms that are not improving with routine treatments, an MRI might be ordered to rule out a partial tendon tear or other diagnosis. Treatment is almost always nonsurgical. As with most tendinitis problems, treatment initially consists of rest. In this case, rest is usually just avoiding or limiting activities that cause pain, such as throwing. Ice, anti-inflammatory medications, and physical therapy can be helpful as well. When symptoms improve, a throwing program or other exercise activities can be slowly started. Occasionally patients who have experienced triceps tendinitis for a long period of time do not improve with simple measures. Sports medicine physicians typically try to avoid cortisone injections into the tendon for fear of increasing the chance of a triceps tendon rupture, although this treatment can be attempted once. Occasionally surgery to cut out a small portion of the diseased tendon and repairing the tendon primarily can be attempted. 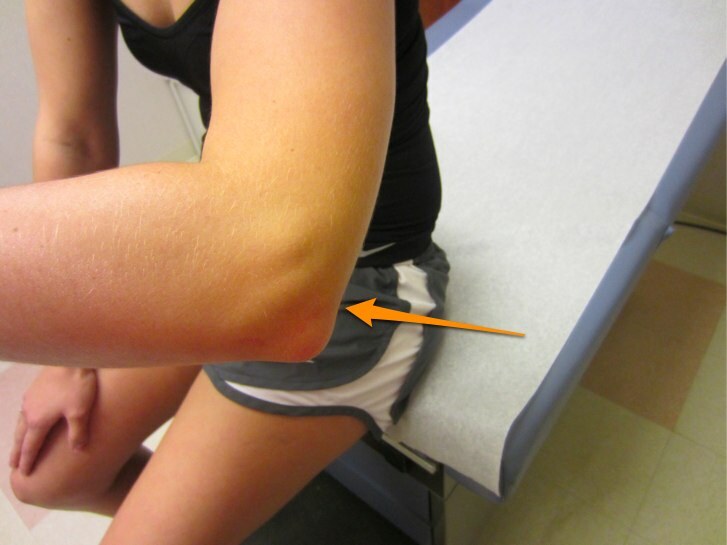 The pain from triceps tendinitis is centered in the triceps tendon just above the tip of the elbow (orange arrow).